Watching a fight with riveted fear and intrigue, while chairs and bodies crunch around you is the edge of the seat adventure Daniel Gardener maneuvers his readers and hero through during each page of Tourquoise Riskies. The dry corporate sales meetings are transfigured into the warrior's experience of conquering and captivating. 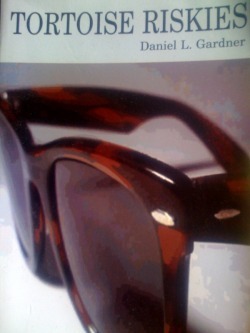 Daniel Gardener's hero, glides as smoothly through romantic interludes with chic and brilliant women as through bloody multiple near-misses with the law and hoodlums. This biographical fiction draws the reader into the underworld of drug dealings and corporate finagling and juxtaposes these worlds with the hunger for philosophical ideals and deep human connection. The hero dodges his conscience and forges into his extreme need for near-death adventure and then smashes repeatedly into the hands of his longing for kindness, truths and ethical quandries.